For your first session I will ask you to fill out a brief intake form, which is intended for contact information and some health history. Afterwards, we will chat for a few minutes about what was written on the intake form and how we will proceed with the session. The session is done with bare feet. If your feet are too sensitive or cold to be bare, please let me know and we can adjust accordingly. I'm all about accommodating you, so if there is anything I can do to assist your comfort, please let me know. 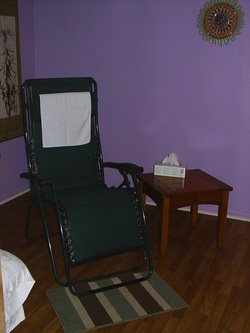 During the session you will be in a reclined chair or on a massage type table. When working on the feet I will use a variety of techniques. Some of these are called relaxation techniques which mainly help to relax the joints of the feet. Others are intended to address the reflexes of the feet. The reflex techniques are typically deeper pointed pressure to help stimulate deficient energy flow in the feet, in effect stimulating and relaxing the entire body. If the pressure or sensation is too(italics) intense for please let me know. During the session I'll check in with you regarding the pressure and your comfort. At the end of the session I'll place my fingers between your toes to give those small joints a nice relaxing stretch. I look forward to working with you in providing excellent reflexology.